This is one of my favorite color combinations. The aqua crystals pick up the light from the metallic gold floss beautifully. 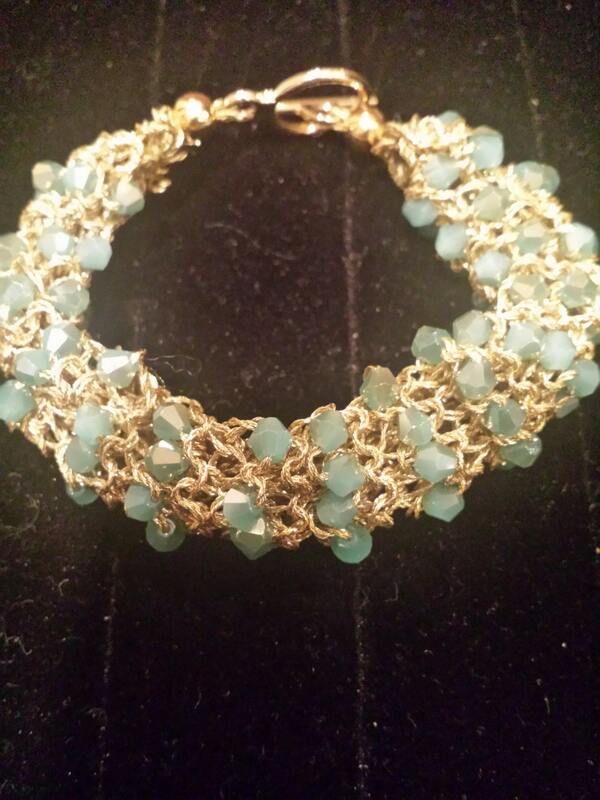 This bracelet is a conversation piece and so comfortable to wear on your wrist. The bracelet measures 7 1/2 inches from end to end and can stretch a bit to fit a slightly larger wrist. I can make this bracelet specific to your wrist size if necessary. It measures 3/4" wide. If you do not like this particular color combination, contact me and we can design a bracelet just for you or your recipient. When purchased, this bracelet will be shipped in a padded envelope unless you would prefer to use a different method.